I love a nice slice of traditional carrot cake and will grab it for dessert if we are out for dinner somewhere (which doesn’t happen very often). For some reason it’s not something I bake on a regular basis. I don’t know why. 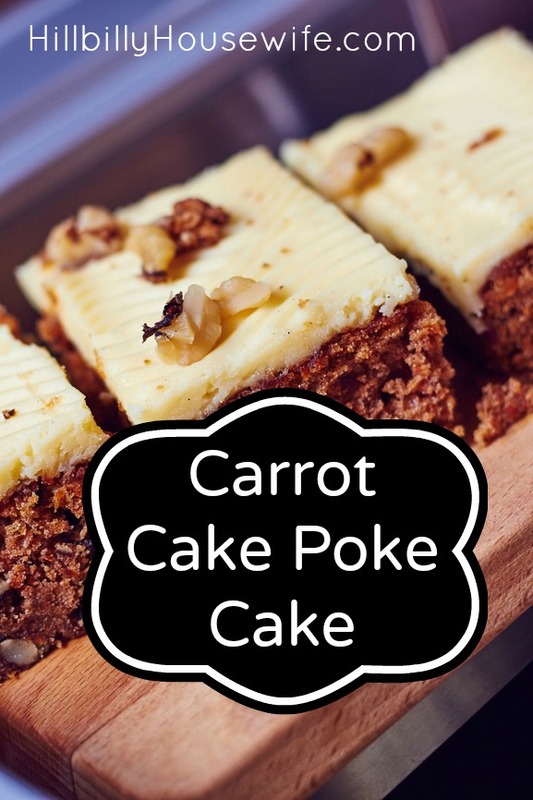 Instead, when I really have to have some carrot cake, I started making this fun poke cake version instead. It’s yummy and goes together quickly. It also makes for a great birthday cake. Prepare packaged cake as directed, and then stir in raisins and carrots until well mixed. Pour into a 9×13 pan and bake as directed. Using a fork or skewer poke holes all around the cake about 1/2 inch apart. In a separate bowl, pour boiling water over dry gelatin and mix for 2 minutes until dissolved. Immediately pour over cake. Mix butter, cream cheese and pumpkin pie spice in a medium bowl with an electric mixer until well blended. Gradually add powdered sugar, beating until all powdered sugar has been used and mixture is well blended. Spread evenly over cake.